Happy New Year, y’all! Hope everyone had a fun evening celebrating 2014 and welcoming a fresh start with 2015! As you’ll see in tomorrow’s outfit post, now’s the time to pile on the cashmere and pick up the coziest pieces since they are all on sale! Especially with all the resort and spring collections hitting stores right now. While I was perusing a few of my favorite end of season sales, I noticed an abundance of adorable spring things on sale too! Shopping these sales will help you curate your spring wardrobe, especially for those upcoming beach vacay’s (hello, spring break?). 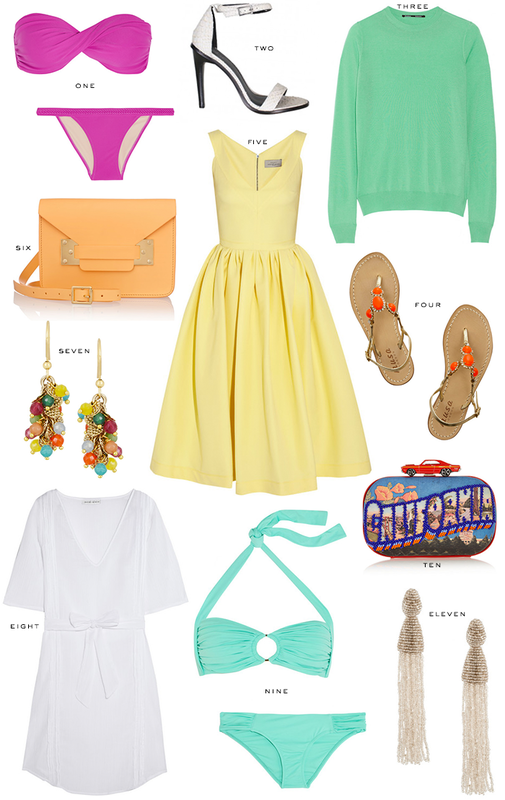 A few favorites I found include this pale pink Victoria Beckham bag, this simple coverup, and this bright bikini. So fun! I like the citrus colored bag. Happy New Year! That yellow dress and tassel earrings have me dreaming of warmer temps! Ah dreaming of warmer weather now! Such great sale finds! I can wear all of those pretty much year round in Florida. I’m loving all of the bright colors!